Christopher Columbus brought squash back to Europe from the New World, and like other native American foods, their cultivation was introduced to the world by Portuguese and Spanish explorers. Zucchini is the best known of all the summer squash. The entire vegetable, including its flesh, seeds, skin, and flower, is edible. Unlike winter squash, summer squash are fragile and cannot be stored for long periods of time. Zucchini are loaded with potassium, which helps to regulate heart function and blood pressure. They are low in fat and have zero cholesterol. The traditional nutrients provided by zucchini are pretty impressive. They are an excellent source of manganese, magnesium, potassium and copper. Low in calories, this vegetable is certainly a hit with dieters. Zucchini is available all year round. 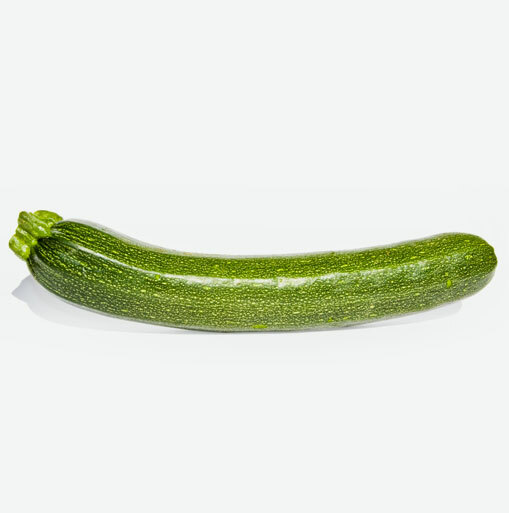 Select small to medium–sized zucchini that are free of cuts or blemishes. Choose ones that are firm and have no spots. Refrigerate zucchini unwashed and in a plastic bag. These squash have tender skin, which don’t give them a long life; use them within 3 to 4 days. When you are ready to use zucchini, scrub them under cold running water by rubbing them with your hands to remove any dirt. Be careful when you wash them, as their skin is very fragile. Zucchini is great in stir-fries, added to soups, grated into muffins and breads or steamed as a side vegetable. Its rapid cooking time pleases hurried chefs. Sprinkle grated zucchini or other summer squash on top of salads and sandwiches. Enjoy an easy to make ratatouille by sautéing zucchini, onions, bell peppers, eggplant and tomatoes and then simmering the mixture in tomato sauce. To season, add about one teaspoon of oregano along with some sea salt and pepper to taste. When adding zucchini or other summer squash to your favourite muffin or bread recipe, decrease the amount of liquid in the recipe by about one-third to compensate for the moisture present in the squash.